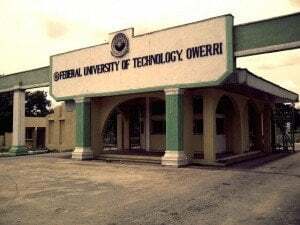 All applicants must forward their transcript to reach the Deputy Registrar/Secretary, Postgraduate School, Federal University of Technology, Owerri, Imo State, Nigeria, not later than November 5, 2018 January 15, 2019 February 28, 2019. Recommended: List of Universities Selling Postgraduate Forms for 2018/2019 Academic Session. Please, I want to apply for a PGD course in civil engineering, is it late to apply now? Good evening, bro. What time of the year will the PG admission list be out and will I be accepted for the fact dat I applied on Oct 15 before my NYSC cert came out days after and I have submitted my application? Good morning, I’m James Nyiam A. I have a B. Eng. In Civil Engineering, 1, can I apply for in the department of project management technology? 2, can the PGD school accept a student copy of trance script direct from the candidate? 3, should I apply who are the required people to stand as referees? Thank. yes James you can apply for Pmt with your engineering background! Good day, pls I’m writing to enquire about the method of sending a transcript to futo registrar / secretary to graduate sch.? Pls can one pass it PGD sch. In person? Who an who can b ur referee? Tnx. please anybody interested in chemical quality control and industrial safety should Identity and buz me up other info on PGD & MSc. Comment Text I have B. ED biology and i wish To apply for pgd public health. am I eligible to apply ? Please, I studied geology and exploration geophysics but I want to do my masters in petroleum engineering… Is it possible? Can we be friends? I’m as well intending to buy the form. Is there an entrance exam for the master’s program? Please I’ve tried severally to pay and d payment isn’t going through. What should I do? Please i would like to know if sales of the forms are still available. Thank you. My Name is Uchechi Fortune Chigozie. Please Segun i came out with a second class lower, a CGPA of 2.96 to be precise and i intend doing my MSc. in Quality Control and Industrial Safety. Please am I qualified to do so? Kindly respond..God bless! CAn u pLs creAte a pLatlform maybe on whatsApp whr canDidateS can meet eAch odaS?? Please I came out with a second class lower and a CGPA of 2.96 at the Redeemer’s University and I am planning on doing my MSc. in Quality Control and Industrial Safety, Please Am I Qualified to do so? I need to know the courses offered in PGD, my interest is in electrical elected tonic engineering OR instrumentation and control engineering.